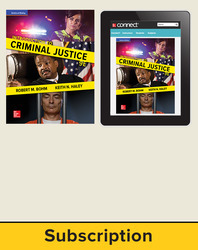 ROBERT M. BOHM is professor of Criminal Justice and Legal Studies at the University of Central Florida in Orlando. He has also been a faculty member in the Departments of Criminal Justice at the University of North Carolina at Charlotte (1989–1995) and at Jacksonville State University in Alabama (1979–1989). From 1973 to 1974, he worked for the Jackson County Department of Corrections in Kansas City, Missouri, first as a corrections officer and later as an instructor/counselor in the Model Inmate Employment Program, a Law Enforcement Assistance Administration sponsored–work-release project. He received his PhD in Criminology from Florida State University in 1980. He has published numerous journal articles and book chapters in the areas of criminal justice and criminology. Besides being the coauthor of Introduction to Criminal Justice, 4th ed. update (McGraw-Hill, 2007), he is the editor of The Death Penalty in America: Current Research, the author of A Primer on Crime and Delinquency Theory, 2nd ed., and Deathquest II: An Introduction to the Theory and Practice of Capital Punishment in the United States, 2nd ed., and an editor (with James R. Acker and Charles S. Lanier) of America’s Experiment with Capital Punishment: Reflections on the Past, Present, and Future of the Ultimate Sanction, 2nd ed., and Demystifying Crime and Criminal Justice (with Jeffery T. Walker). He has been active in the American Society of Criminology, the Southern Criminal Justice Association, and especially the Academy of Criminal Justice Sciences, having served as Trustee-at-Large (1987–90), Second Vice-President (1990–91), First Vice-President (1991–92), and President (1992–93). In 1989, he was selected as the Outstanding Educator of the Year by the Southern Criminal Justice Association. In 1999, he was elected a Fellow of the Academy of Criminal Justice Sciences and, in 2001, he was presented with the Founder’s Award of the Academy of Criminal Justice Sciences. KEITH N. HALEY is professor of Criminal Justice, teaching in both graduate and undergraduate degree programs in the School of Criminal Justice, and associate vice president for special projects at Tiffin University. Mr. Haley has also been the dean of the School of Criminal Justice, and the dean of the School of Off-Campus Learning at Tiffin University. He has acted as the primary contact for the TU MBA program in Bucharest, Romania, and the head of the Tiffin University Romania Study team that worked to establish a Master of Community Justice Administration degree program at the University of Bucharest. He has also served as coordinator of the criminal justice programs at Collin County Community College in Texas; executive director of the Ohio Peace Officer Training Commission; chairman of the criminal justice program at the University of Cincinnati; police officer in Dayton, Ohio; community school director in Springfield, Ohio; director of the criminal justice program at Redlands Community College in Oklahoma; and electronics repairman and NCO in the U.S. Marine Corps. Haley holds a BS in Education from Wright State University and an MS in Criminal Justice from Michigan State University. He is the author, coauthor, and/or editor of 12 books, several book chapters, and many articles in criminal justice publications. He has served as a consultant to many public service, university, business, and industrial organizations on management, online learning, criminal justice research, and memory skills. Haley is also the secretary of the police section of the Academy of Criminal Justice Sciences. Haley received the 2001 Nikolai N. Khaladjan International Award for Innovation in Higher Education. The Khaladjan Award is given to the higher education program that is the most innovative and has the widest potential for impact on postsecondary education.